Lawrence Livermore National Laboratory (LLNL) researchers have developed a new biological sensor that could help clinicians better diagnose cancer and epilepsy. The image shows a cross-section of a lipid bilayer with an embedded carbon nanotube porin resting on a silicon nanoribbon sensor surface. The porin contains a single hydrogen-bonded chain of water molecules that relays protons to the nanoribbon. A lipid bilayer protects the sensor from fouling by proteins and other biomolecules. Biological sensors monitor small molecules, ions and protons and are vital as a medical diagnostic. Even the simplest signals, such as intracellular pH level, can provide important information for the medical community. For example, acidification of tumors because of elevated glucose uptake and lactic acid release is a biomarker of cancer cells. Likewise, acidification of extracellular fluid is one of the key processes during epileptic seizures. But manmade biosensors have limitations such as biocompatibility and fouling (the accumulation of unwanted materials that impede or interfere with the function of the molecule). 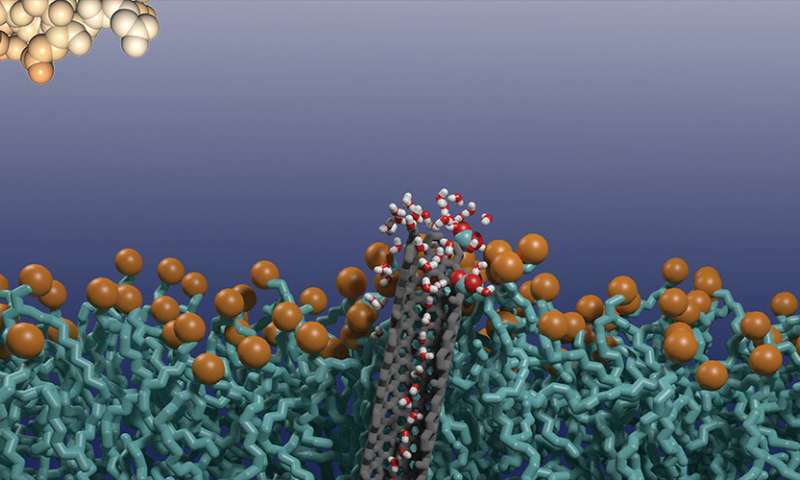 Biological systems are adept at protecting and separating vital components of biological machinery with semipermeable membranes that often contain deﬁned pores and gates to restrict transmembrane transport only to speciﬁc species. Learning from biology, the LLNL team, led by Aleksandr Noy, created a pH sensor by integrating silicon nanoribbon transistor sensors with an antifouling lipid bilayer coating that contains proton-permeable carbon nanotube porin (CNTP) channels and demonstrated robust pH detection using those sensors in a variety of complex biological ﬂuids. "Our device is a versatile platform for real-time, label-free, highly sensitive detection of disease biomarkers, DNA mismatches and viruses," said Xi Chen, a UC Merced graduate student, a UC-National Lab In-residence graduate fellow at Lawrence Livermore and a first author in a cover article in the journal Nano Letters. He said the biosensor eventually could even be implantable. To create the pH sensor, the lipid membrane needs to incorporate a robust channel that is highly permeable (and, ideally, highly speciﬁc) to protons. Noy's team previously showed that narrow 0.8 nanometer CNTPs (about 10 nanometers of carbon nanotube segments that spontaneously insert into a lipid membrane and form transmembrane channels) have extremely high proton permeability that is an order of magnitude higher than proton permeability of bulk water. Extreme water confinement in the 0.8-nm-diameter nanotube pores is responsible for creating conditions that favor fast proton transport. Small pore size and high proton permeability also ensure that CNTPs can eﬀectively block most of the fouling components of biological mixtures and prevent them from reaching the sensor surface. "For each of these experiments, we have characterized the ability of our sensor to respond to variations in the solution pH values before and after continuous exposure to the diﬀerent foulant mixtures," Noy said. "When the lipid bilayer incorporated CNTP channels, the pH response was preserved and showed very little signs of degradation." In the future, the team could engineer the CNTPs to transmit specific ions and small molecules while blocking other biomolecules. This could transform the device into a versatile platform-type sensing technology that could be used in applications ranging from disease diagnosis, genetic screening and drug discovery.